Fortnite: Battle Royale's map is chock full of awesome places to loot and fight it out. Sometimes, the hardest part of the early game is figuring out where to land. We've got some tips on where to land for the best loot, the most action, and even if you want to avoid an early game confrontation. If you're looking to get into a fight immediately in Fortnite, there's plenty of good spots for that. Not everyone wants to slowly loot and work their way towards the ending circle, so here's where to go when you want to put the "battle" in "battle royale" right away. If you want to enjoy hell on earth right from the get-go, then land at Tilted Towers. By far the most popular spot on the map, Tilted is filled to the gills with loot spawns and chests. The area is large enough that you can spot enemies and land somewhat isolated, at least long enough to find a gun before you inevitably find combat within a few seconds. There's lots of tall buildings with small engagement areas, and a good option is to climb as high as you can and fire down upon unsuspecting enemies in the streets. This is another solid option because it's varied and big enough to allow you to find weapons before fighting. The western section of the town is filled with residential houses, while the west has retail stores. There's decent loot and chests throughout. Salty is popular because of its central location, as the Battle Bus will often fly right over or very near this residential town. There's a good amount of houses here with loot in all of them. Make sure to check the attics and roofs for chests. One of the most balanced looting areas in the game, Greasy holds residential houses as well as the Durr Burger restaurant. Durr Burger is the focal point of the area and will most likely be a popular landing spot, but the building in the center of the map often spawns two to three chests upstairs. One of the newest locations on the map features a big city but there's also a lot of smaller buildings to check out. Try the gas station, the garage, and more down to the southern area of the map. If you want to avoid confrontation in the early game and build up your loot, then there's plenty of options for that too. If you've experienced some bad luck finding guns early on, then these are the places you can land to slow things down a bit. This secluded area offers a massive lodge, a communications tower with a number of chests, and smaller cabins. There's also a ton of trees here so you can build up your wood materials in the early game while offering some peace and quiet. This isn't the most popular spot to land. Offering lots of stone and wood materials, Haunted Hills also has a decent chest spawn rate. You can find a good four or five chests here if you land by yourself, and there's a small number of loot spawns as well. As with any area off the beaten bath, though, you might get bad circle luck. 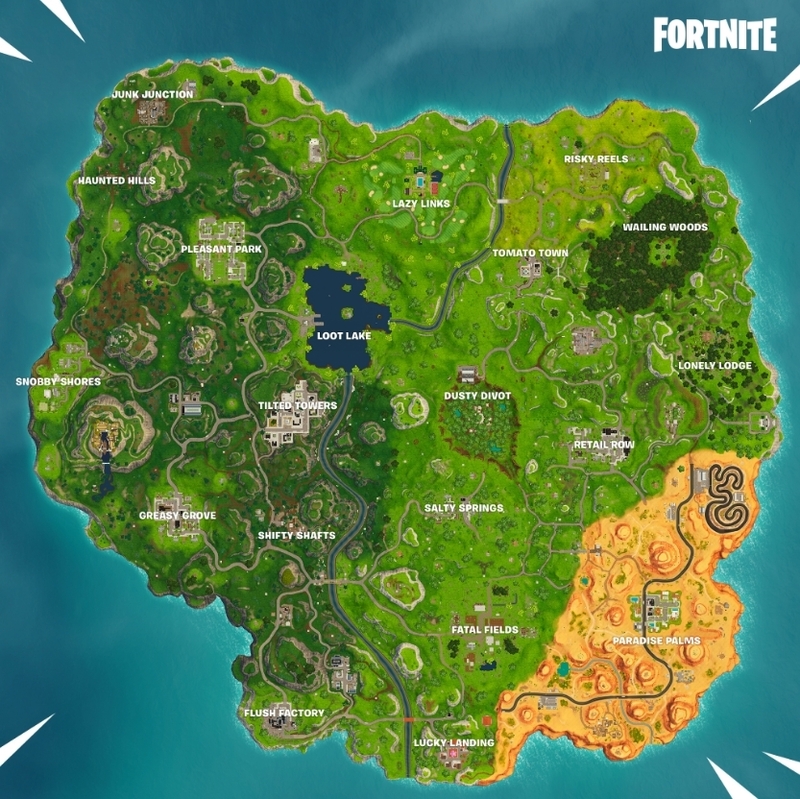 Snobby is located as far west as you can possibly go, so when the Battle Bus has an eastern path, this is a great choice to land away from confrontation for a really good amount of loot. There's five large-scale residential houses to ransack here. Located on the southern tip of the island, Lucky Landing has a decent amount of loot for both Solos and Squads. Once you're done here, move due north and make your way to Fatal Fields to get whatever is left over if people already landed there.